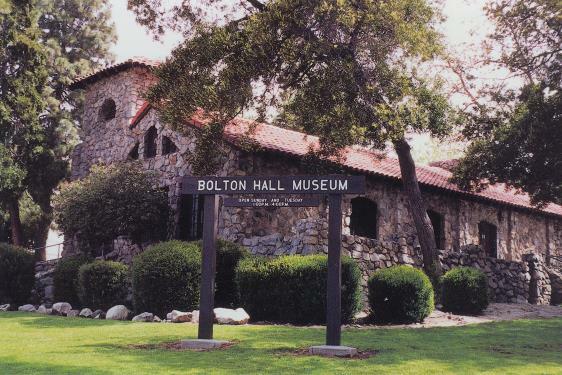 Bolton Hall is available for rental to private groups and community organizations. The building is set within the beautiful Little Landers Park at the corner of Commerce Avenue and Valmont Street in Tujunga, California. Street parking (only) is available. The interior of the building has been restored and features the original stone fireplace and hardwood floors. Although the fireplace is beautiful, no open flames are allowed in the building or in the surrounding park area. The main room is approximately 25 by 30 feet and can accommodate the following: 60 people with theatre style seating, 50 people seated at tables, 80 people reception style (no tables or chairs). We have a small kitchen which can be used to store and warm food. No cooking is allowed. Because we are in a residential area, all events must begin after 8:00 AM and end no later than 10:00 PM. Alcoholic beverages and smoking are prohibited in the building and in the park. determine if we are the right venue for your event. contact us at (818) 352-3420, send an e-mail, or complete an on-line inquiry form.